RIP, Bullet Bill Dudley: "Bullet" Bill Dudley, a former Steeler and 1966 inductee into the Hall of Fame, just passed away after a short illness at the age of 88 in Lynchburg, Virginia. to all the pirate fans who signed the open letter...."DON'T GO TO THE GAMES!" If anybody gets a chance, I don't know if Don mentioned this over the last few days or not, but check out the NFL's Pepsi Refresh Project and vote for the player's cause which you think deserves the 100,000 donation. Sanchez, Brees, and DeMarcus Ware all make very convincing arguments for their causes and it's worth 2 minutes to help some people out. Corey - I didn't see any place to "sign" the letter, but I fully subscribe to it. What I would like to see, is some of the fans who obviously think ownership should have as much time as they need to get a winning team on the field, draw their line in the sand and tell us how long you'll stand behind this owner before getting on board with everyone else and demand the team be sold. Is it 3, 5 more years...longer? Funny thing is, I bet anyone who's still supporting this ownership, will redraw the line every time the Pirates hire a new GM, make a non-impressive player transaction, or come up with some BS new strategy after gutting the team and slashing payroll. They say you can tell the intelligence of a dog by covering its head with a towel and the quicker they get it off, the smarter a dog it is. Seems to me some of the dogs here are still waiting for the towel to magically disappear. Corey: Nail meet head. I'm so sick of the endless bitching about the Pirates only to read the next day that they had 25,000 people there for a ballgame + Foreigner concert promotion. If all you care about are bobbleheads, fireworks, and 80's hair bands, keep going to the games. Nutting is happy to sell those to you while he continues pocketing huge profits from MLB. But if you actually care about what happens ON THE FIELD, stop going. The only way Nuttjob sells the team is if the pressure gets too intense which means MLB has to get involved, the national media, etc etc. And that only happens when the team plays to 1,000 people every night. 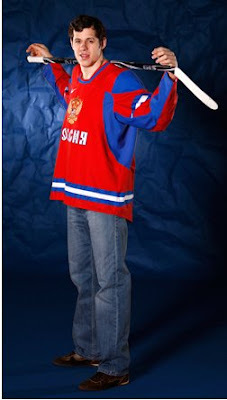 On another note, the Malkin team Russia jersey is SWEET. I'd love to get one but no way am I blowing $129.00 on a hockey sweater. I actually like the team Canada jerseys the best. Maybe one day I'll get a Fleury one. Actually, I've long stated my desire to get a Fleury Wilkes Barre-Scranton "baby" Penguins jersey from his stint there. Anybody have the hookup on that? The Pirates ownership trades away players as soon as they show signs of talent, spends money in the most ridiculous fashion when they spend any at all on salaries, and has done more to destroy a franchise than Al Davis and Dan Snyder have combined to do to their respective teams. They've done everything humanly possible to demonstrate their incompetence and disinterest. How can they even pretend that they give a damn about how the Pirates do?